Ugh, I need all new shoes. Arrrrgh!!! My feet have grown. I've never had good feet -- they are absurdly wide, so even though my length was a 6.5, I'd have to wear a 7.5-8 in order to find shoes that didn't squeeze my little toe to death. I used to daydream about having absurd elective surgery that would chop off my little toe, so I'd have normal-sized feet. Anyway, since I got pregnant with the Wee Boy and birthed him, I can officially say that I now straight up wear an 8. Sometimes even an 8.5. No, my size 7EEEE (that's quadE) shoes are still too narrow for my boxy feet. I don't have a shoe fetish. In fact, I was pretty pleased that I already owned most of the shoes I ever really needed. But now ... sigh. 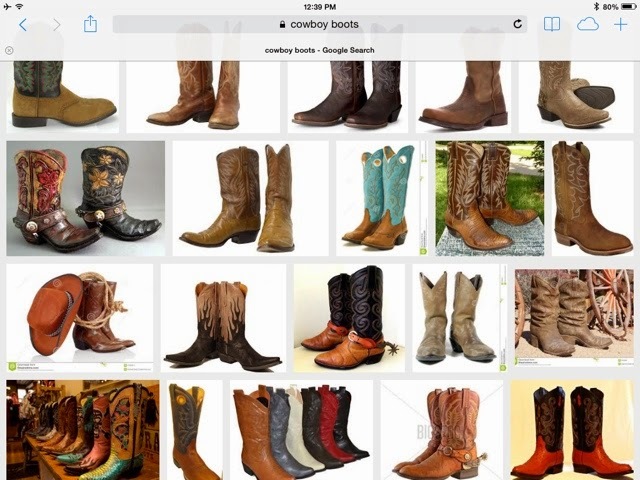 I am going to have to start collecting not just sneakers and fancy shoes, but new cowboy boots. I see a trip to Nashville in my future. Or at least Zappos. Next week I promise some more deep and thoughtful blogs. Or at least, I'll give you a wrap-up of my Burns Supper menu. 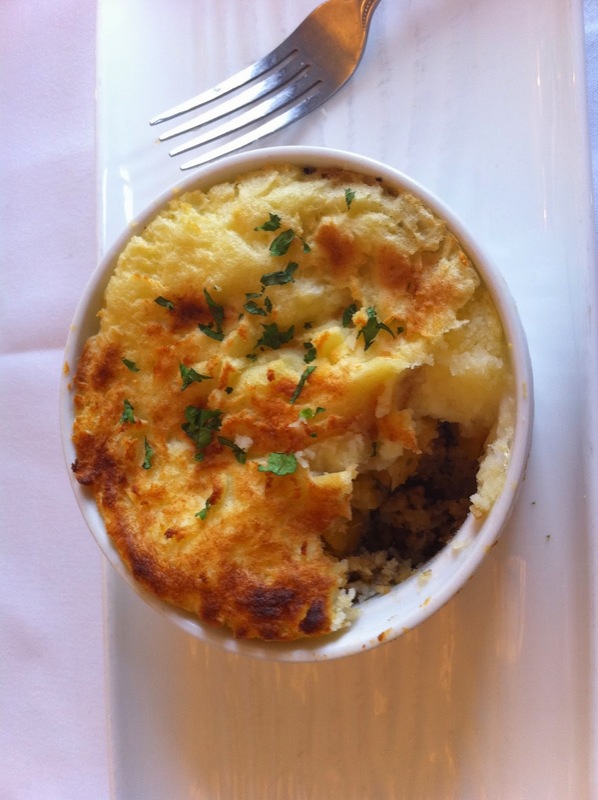 I finally found a delicious vegetarian haggis recipe, and I can't wait to share it with you. A secret I have been withholding. I have a confession to make. You know that one time when Madonna moved to London and developed this bizarro quasi-British accent? I have done something similarly annoying (except far fewer people will care about my quirk). I now eat Continental-style. Worse than that: I eat left-handed Continental. I kid you not. I don't even remember when it happened. 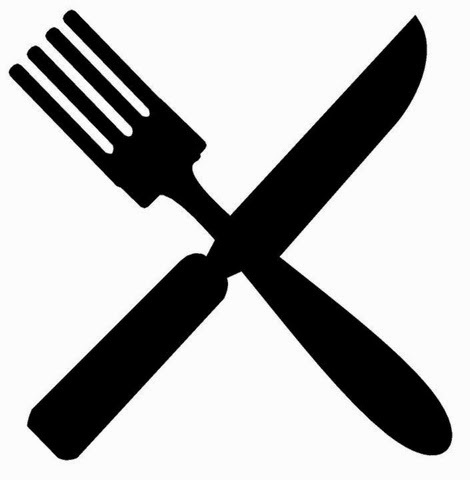 Occasionally when I was abroad and with Duchal company (okay, I've never dined with a Duke, but I wanted to use the word "duchal" and really, just sub it for "posh," I suppose) and didn't want to call attention to my barbaric American ways, I would attempt this style of holding the knife and fork. Oddly, the right-handed way never felt comfortable. But I have apparently grown very comfortable with my knife in my left hand, and I didn't notice until recently that I've been eating this way for some time now, without giving it a second thought. Anyway, I know I am already the irksome woman who talks about Scotland far too much, but now I am full-blown eats-like-an-outsider. This morning I tried going back to American dining while eating my crepe (oh! how annoying I am! a crepe?!?! ), but it felt sloppy and awkward. I am a lost cause. An unAmerican fool. Forgive me! *I'm not actually left-handed, but my mother is. I do most things with my right hand, but am ambidextrous in many ways (and many times prefer my left to my right -- either because of ambidexterity or because I copied my sinister mother). 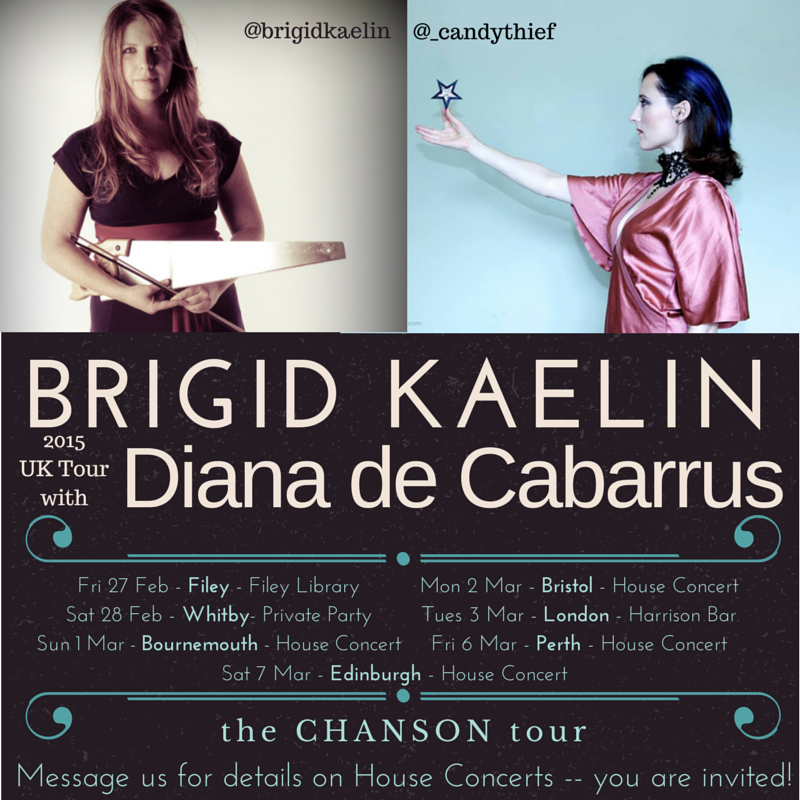 UK Tour Dates Announcement - Brigid w/ Diana de Cabarrus. Our Burns Supper with a few friends was magnificent fun, and I woke up this morning thinking how excited I am to get back to the United Kingdom in T-minus four weeks! I'll be touring with the one and only Diana de Cabarrus (amazing name), who is a splendiloquent performer, guitarist, cellist, singer, string-instrument-player, and all-round nice person. That means shows in Filey, Whitby, Bournemouth, Bristol, London, Perth, and Edinburgh. We have potential shows on the 4th and 5th, but they aren't confirmed yet ... and I'm contemplating leaving those dates blank instead and hitting every castle possible on the drive from London to Perth (it's a looooooong drive). If there is a house concert in your area, please contact me for details that I can message you privately. House Concerts are my absolute favorite shows to play, but because they are people's private homes, one mustn't publicize names or addresses. Happy to share them with you if you are interested in attending though. Just shoot me or Diana a message, and we will fill you in. Cheerio, my friends! I'm off to make a cuppa. Mmmmmm. My simple Burns Supper menu. I need to set an alarm for around 2p every day to remind me that dinner will, yet again, be happening. It's a flipping surprise to me every day after work, and I swear I am of above average intelligence. In related news, it's apparently the weekend already, and I could have sworn it was only Tuesday. ALSO, IT'S BURNS SUPPER WEEKEND!!! I'm still not wealthy enough to hire a bagpiper to march through my living room, but I am going to have my annual Burns Supper. One of these days, I'll have single barrel Scotch whisky and a caterer. Until then, I will continue to scour the internet in search of the perfect vegetarian haggis recipe. It exists; I have not found it. for any single malt that tastes like dirt. Unless any of you blog readers are also volunteer bagpipers (I wouldn't dare ask you to play for free, but if you're a starving piper with a hankering for some Laphroaig, please come address the haggis! ), I will be sticking with pre-fab Scottish music. In the spirit of the poet, we'll have some Robert Burns tunes, like this new recording from my friend Adam Holmes. If I ever get off my bum and record an RB song, I'll perhaps throw that link up here too ... until then, stick with Adam. He's the one with the Scottish accent. I'll also report back next week with our playlist for the evening -- David is in charge of that, so maybe he'll guest blog. I wish I had the patience to prepare a clootie dumpling tomorrow. If you have a few hours to spare for an authentic Scottish dessert, here's the best recipe. 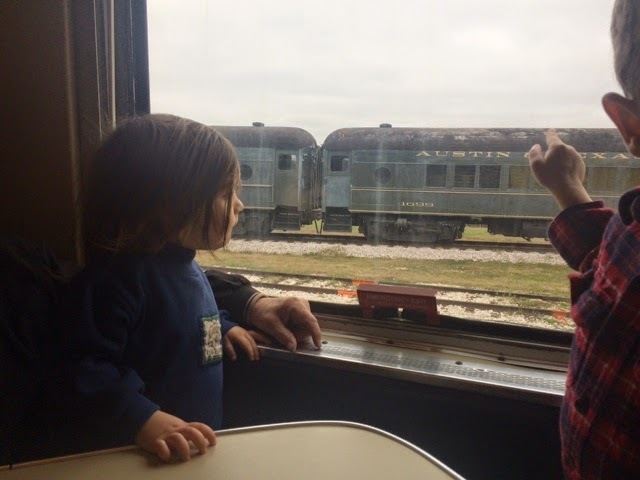 Explaining time to a 2-year-old -- and work trips. I've spent plenty of time daydreaming about castles and teacups, but don't think I haven't also been feeling guilty about leaving my two-year-old for almost two weeks. My head knows he will be fine. He's a very sensitive boy, however, and feels all the feels all the time. I've been racking my brain trying to figure out things I can do to help him cope -- or at least help him understand time and when I'll be home again. He understands concepts like "yesterday" and "tomorrow" and even correctly uses phrases like "last year" or "next week" -- about fifty percent of the time. I know he understands when things have already happened or when things will happen eventually. But sometimes he says things like, "Daddy is at a hotel for work. He's coming home in two years, like he always does." We have been using a wall calendar (remember those?) to mark an "X" every morning and talk about days. 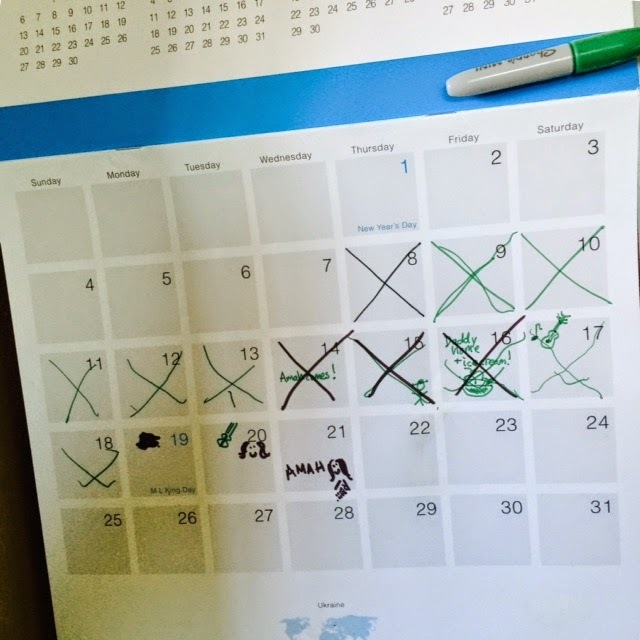 I drew pictures on various days, so he would have some small things to look forward to -- an attempt to help with patience and an understanding of how long a day or two days or a week is. When David left town last week, I drew a picture of him coming home on Friday, along with a picture of the ice cream that we decided we would get as a treat. This only mildly backfired, as it then meant that the Wee Boy asked, "Is it time for ice cream right now," pretty much fifty times a day. So I'm not really sure whether it was the calendar that helped him understand time, or if he just learned that asking for something 400 times means he will eventually get it. I think maybe when I'm actually gone, I'll leave behind some paper chains that he can tear off day by day as a countdown until Mommy is home! I am starting to get super super excited about my upcoming tour. Work permit secured and official dates to be announced next week, but feel free to email me if you're in the United Kingdom and are curious about which dates to hold. While I am trying to wrap my head around being away from the Wee Boy for two weeks (the thoughts in my head scream horrible mother! how dare you! ), I am also trying to focus on the idea that for two straight weeks, I will be performing original music for people who are paying to hear it. 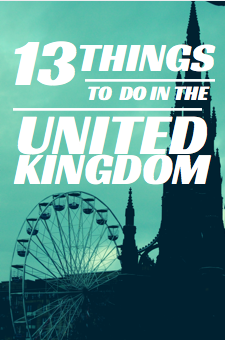 And so many other things that I'll get to see, do and consume while on that small island. Here are a few of the things I'm more-than-I-should-be excited to encounter while I'm traveling. They are in no particular order. Mostly I just started with chocolate because I am pretty much always thinking about chocolate. It's not the best chocolate I've ever had in my life, and, honestly, I prefer dark chocolate. Still, there is magic within a milk chocolate sugary Cadbury, free of high fructose corn syrup. The magic, I think, lies within the massive amounts of choice one encounters at a random gas station. 2. Petrol station, aka "Services"
There is a song that David and I sang when we approached "Services" (It goes SER-vi-ces!! Sing it loudly, a descending Perfect 4th: dotted quarter, eighth, then half note. You're welcome!). Services essentially means, like, a truck stop. Except it's somehow clean and pleasant, and I've only occasionally seen a truck (I mean, lorry). There is usually a Marks & Spencer, filled with delicious and healthful road snack options. Also, even the low-end service stations have thousands of Cadbury options. It's not just grabbing a cuppa that I miss. It's that even when you just pop in for a cuppa, it comes with a lot of dishes. At home, I do everything I can to avoid having to wash extra plates, spoons, etc. Somehow, even in a country where most people do not have dishwashers, there is no dish spared when it comes to the serving of tea. Sugar bowls. Sugar spoons. 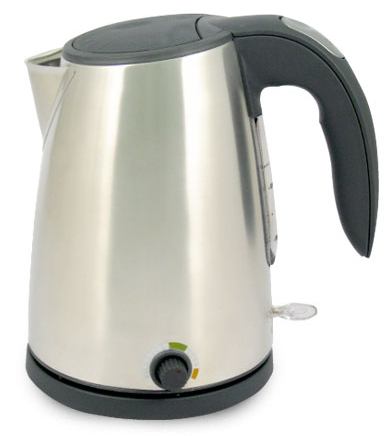 Personal-sized teapots. Saucer. Plate for used teabags. Such luxury! I could go on for years about the amount of cheese available at at 1/10th of the cost. I will likely buy a huge wedge of Brie at the Services for $1.50. Then give myself a bellyache, but it'll be worth it because BARGAIN. I said it already, but CASTLES. Everywhere. Ruined ones, inhabited ones, ghosts of where surely a castle once was. 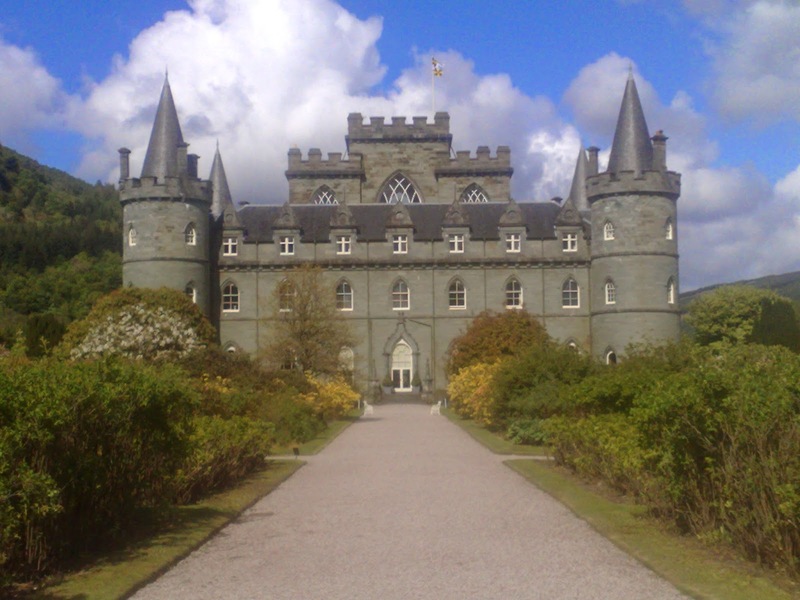 Places where Bonnie Prince Charlie hid, places where princes were entombed alive, and places where dragons once roamed freely! 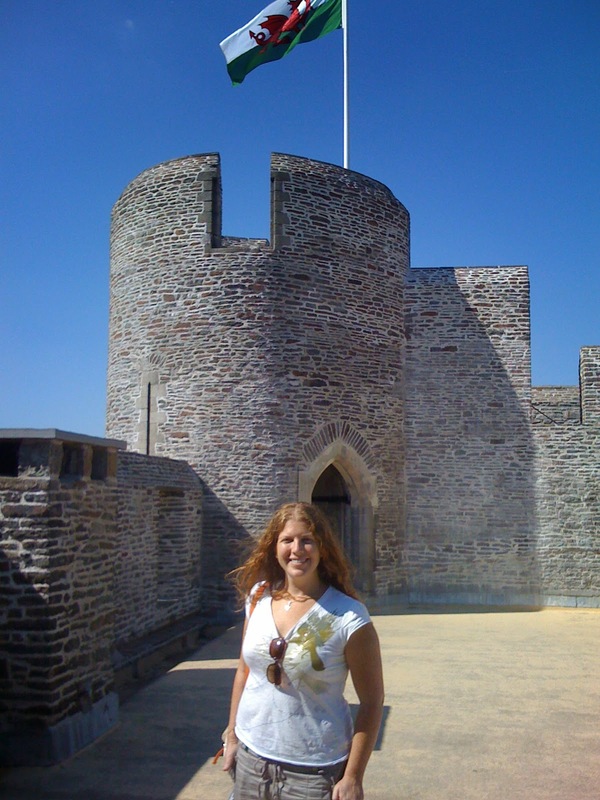 It's way more fun to play Castle Collecting than Cows-in-the-Graveyard. I spent the majority of time living in Scotland pregnant and then nursing round-the-clock, so I didn't get to enjoy the mindblowing selection of whiskies available everywhere. 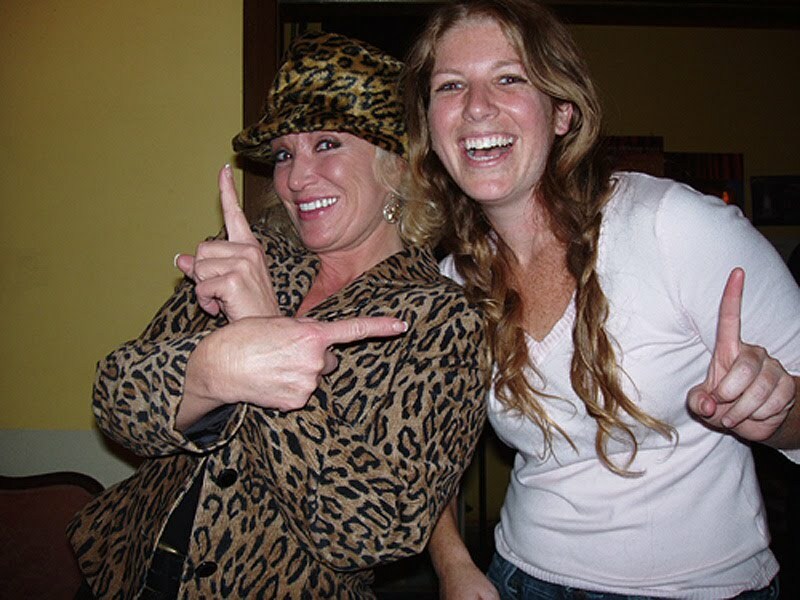 I had great plans to try a new one every week -- even started this defunct blog, wherein I got one drink in before getting knocked up. (Have just revisited that blog, and I now want to restart it. YUM YUM YUM.) I know I'm a Kentucky girl at heart, but I am also a single-malt convert. 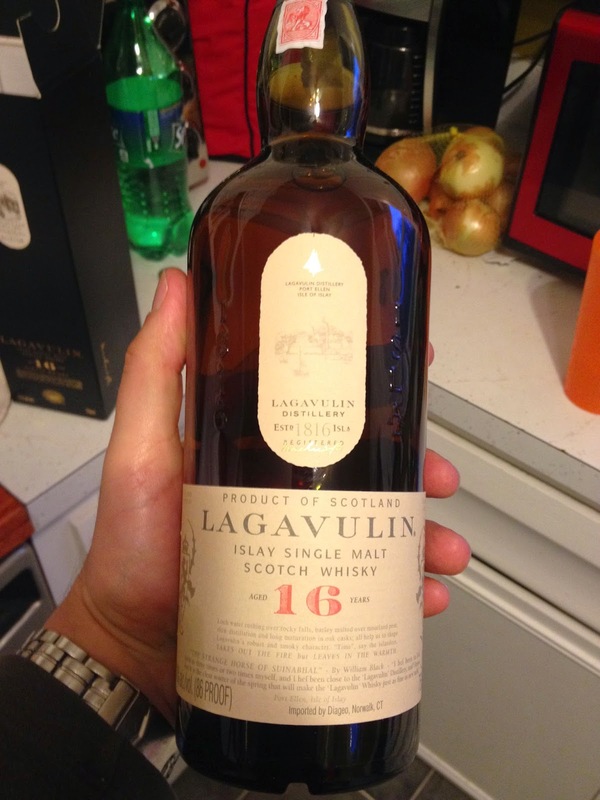 To order a Laphroaig Cask Strength for $5 ... oh my goodness oh my goodness. French fries/steak fries/whatever you call them. They taste more delicious when consumed in dark, basement pub. Also, they come with everything. They accompany deep-fried veggie burgers, curry, etc. 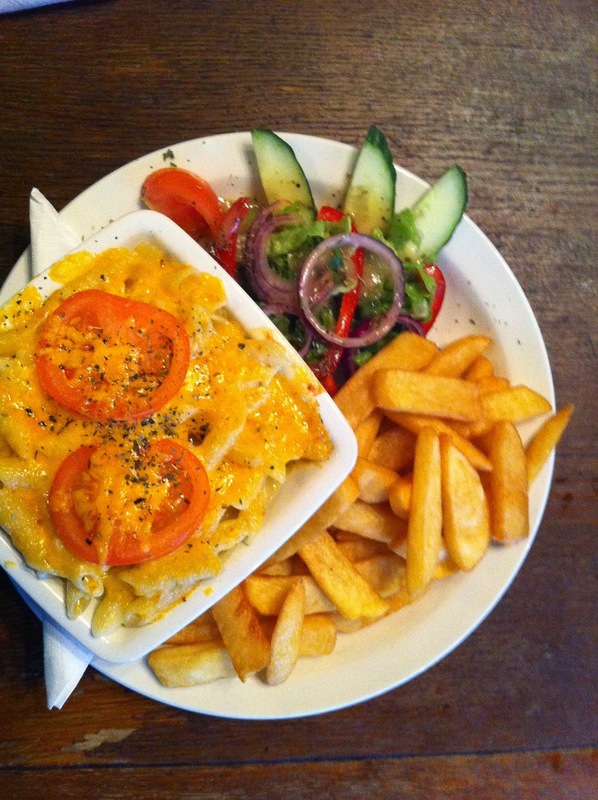 I especially love it when "macaroni & cheese & chips" is the vegetarian option. CC: +Dan Canon . 8. Baked Potatoes as a meal. 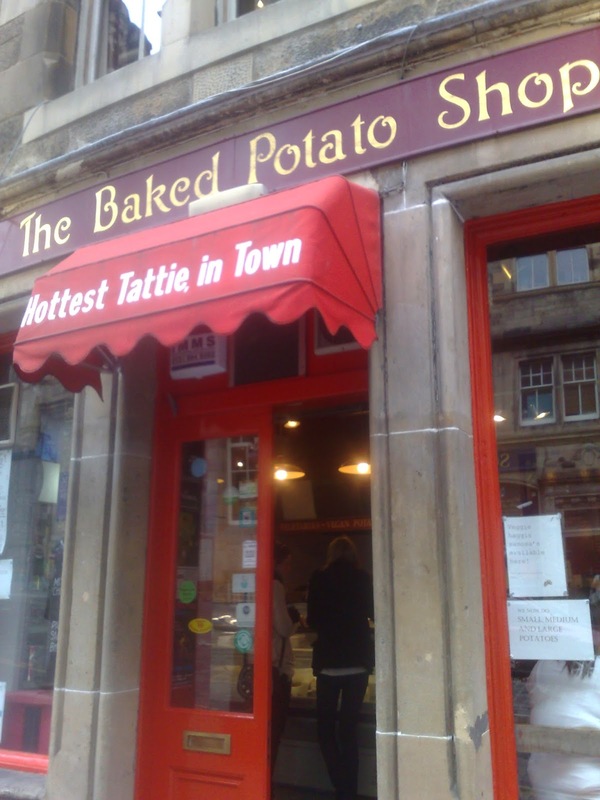 My first meal in Edinburgh almost 20 years ago was at the Baked Potato Shop. I only have a day to spend in this fair city, but you better believe I will have a baked potato with vegetarian haggis. Roll your eyes if you must (meateaters have not yet gotten tired of the vegetarian jokes, which is super annoying, and old, and I don't understand why you don't pick on people who have actual weird eating habits, but whatever, grow up already, that's another blog, piping down now, sorry ...), but vegetarian haggis is divine! Delicious. Perfect. I like it served on a baked tattie with shredded cheese. I also love it served in a dish with neeps and tatties, like a personal casserole. 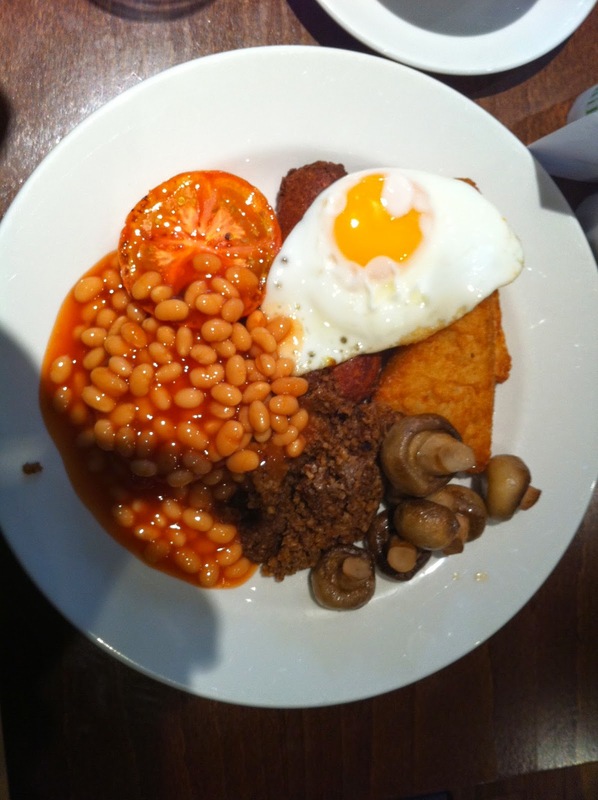 I want to call this "Scottish Breakfast," but my English friends will revolt. And vice versa. We shall stick with "fry-up." A plate-full of grease is good for the whisky-soaked soul. But I won't feel guilty because of that old adage: Breakfast like a king. Lunch like a prince. Dinner like a pauper. I tend to forget that rule by noon, but it's a good justification for fried eggs. Americans will think this means "put half and half in your tea." It does not. It means you get tea, but it's not the tea that is the star. It's the scone. And the clotted cream. The jam is good too, but oh, the cream! Savor. Or savour, if you are really feeling it. Maybe I'm a weirdo, but I love kirkyards. I think it goes back to just a love of history and respect for the past, but I love reading the dates on the tombstones -- and thinking about how many other people have stood on that same hallowed ground, saw the same mountains ... oh, I get all weepy just thinking about it. The graveyards in the UK are beautiful, even with the ghost stories. I love the Edinburgh ghost tours that take you through graveyards. I don't think I'm susceptible to time travel, so I wasn't worried. There are stone circles everywhere, so I can't wait to find one and frolic. The one pictured is just hanging out on a golf course in the Hebrides Islands (Islay). Pausing and reflecting and my fancy electric kettle. This morning: quiet. 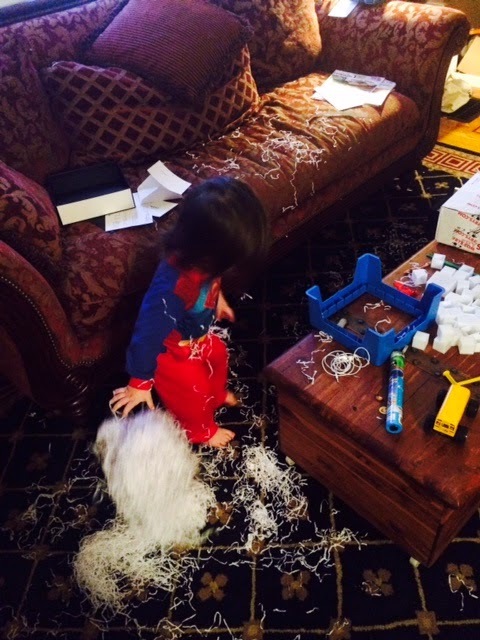 There are strips of packaging paper -- leftover from an enthusiastic boy opening the mail -- strewn all about my living room, with trails of it leading toward the refrigerator and the toy room, but there is quiet. And there is tea. The wee boy has returned to preschool after a bout with the stomach bug that rendered him the most adorable little thing in the history of the universe. "Mommy, mommy, my belly hurts. Mommy, I neeeeeeeed you. I really need to cuddle with you riiiiiight now." My personal favorite was, "Mommy, may I have nursies, please? I need to rehydrate." I have spent a week cuddling the sweet, sick boy. He is happily playing at preschool today, however, all symptoms long gone. Hence, the quiet and the tea. I love it. I really don't love coffee. I feel like coffee is like cornbread: it's not actually very good, but lots of people say they love it. We all nod and agree, and no one wants to be the one to admit that it's merely okay, and only actually yummy with lots of sugar and buttermilk. But tea? I have much to catch up on -- songs to learn, accordion parts to record (for someone else's album; don't get too excited! ), one thousand emails to respond to, packaging paper to clean up. 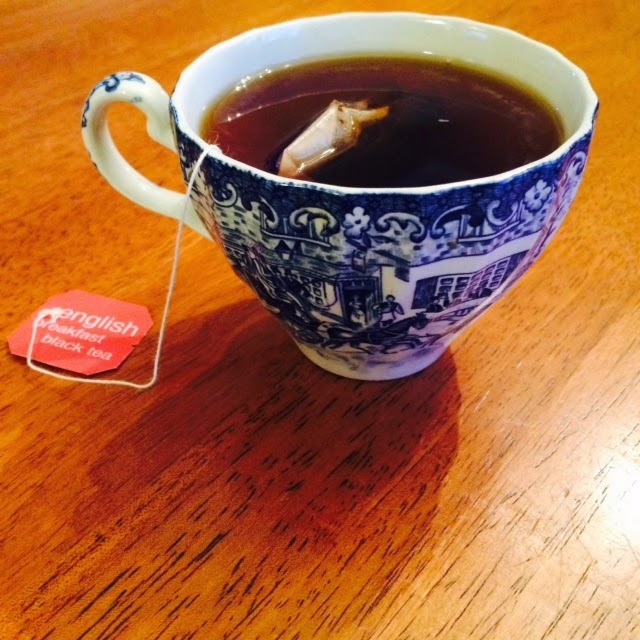 But first: tea. See? That's why I love tea. Pause, boil, pour, steep, sip. Mmmmmmmm. Tea. 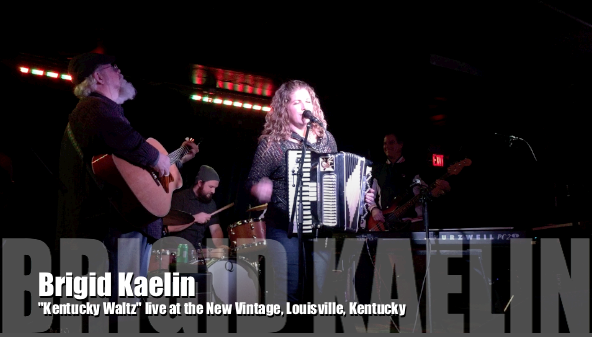 External validation, dancing shoes, and video of "Kentucky Waltz"
I played a full band show last night and SO MANY OF YOU WERE THERE! Seriously, I counted at least fifty people from the crowd who were straight from my mailing list -- people who rarely come out to shows, but who were there grinning and being kind and telling me they read my weepy blogs about my long-lost-career and "chin up, guv'nah" and dancing and clapping and laughing at my silly jokes and high-fiving me after. I had no idea how much external validation would mean to me, but let me tell you. Especially when even people in my own band were saying things, like, "I just hope people will come out to a show that starts at 8:30." But you were there! And you even thanked me for starting on time (well, 10 minutes late, but that's because soundcheck was, like, an hour behind schedule). Anyway, it was a swoonsome evening, and I had fun. I danced and wore a sparkly sweater that made me feel and act a little more Vegas than usual. Alex Wright's band was fantastic, as always. Appalatin was groovelicious, though I admit, I had to leave about 30 minutes into their set, which is totally not cool in the world of band-etiquette. I'm sorry for that. Truthfully it was because they didn't start playing until 11:27pm, and I had a babysitter to sort out. I kind of think band-etiquette is a little different once you have to pay a babysitter -- like, I didn't want to make negative money that night -- but maybe I'm just making excuses. My swanky new jewelry box. Some of you are shuddering, but some of you are nodding in agreement. YOU ARE ALL GOOD PEOPLE. Yes, that's a New Balance shoe box (They are the only brand of shoe that makes EEEE-width sneakers. I basically have square feet.) Check out the many compartments that come in the shoe box. That red mesh one I got from a Delta Business Class flight. Once perfect for eyeshades and comfy transatlantic socks; now perfect for three mismatched earrings and two necklaces tied around a headband. But none of it is valuable, so no harm done, right? As you might imagine, I rarely wear accessories. 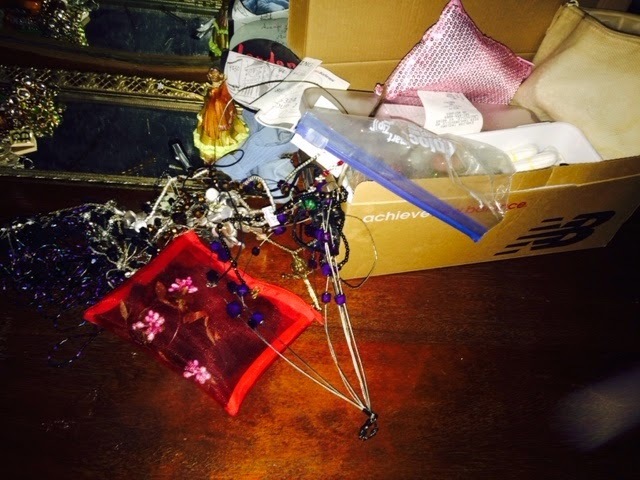 It's kind of not worth the battle of untangling and searching. For Hanukkah this year, however, my husband bought himself me a present. 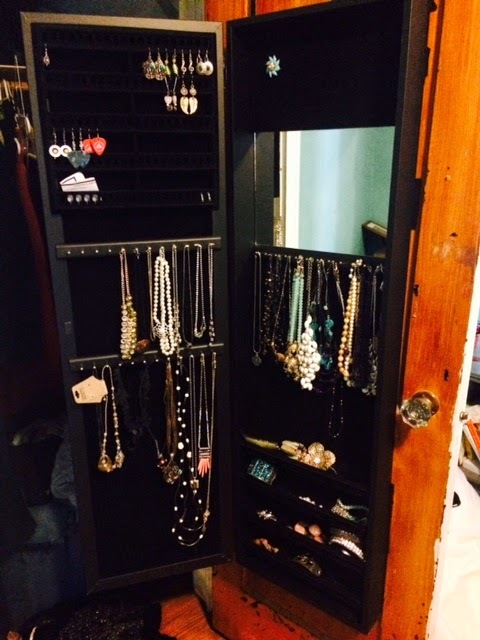 A real jewelry storage thingamajig! I wanted something that didn't take up floor space or real estate on my dresser (our house is from the 1920s, so it's small and mostly closet-less), and my husband wanted something that didn't make him scream with OCD-discomfort at the sight of me trying to find a bracelet. Anyway, it's super cool, and the Wee Boy and I spent about thirty minutes untangling and organizing a few nights ago. Check it out! Also, I have bejeweled myself several days this week, which makes it look like I'm making an effort. The Wee Boy reeeeeeeeeally loves all my sparklies though, so I think I now need to find a childlock. I want to find a link to it and post for you, but I don't want to know how much David spent. So just do some googling if you need one yourself. 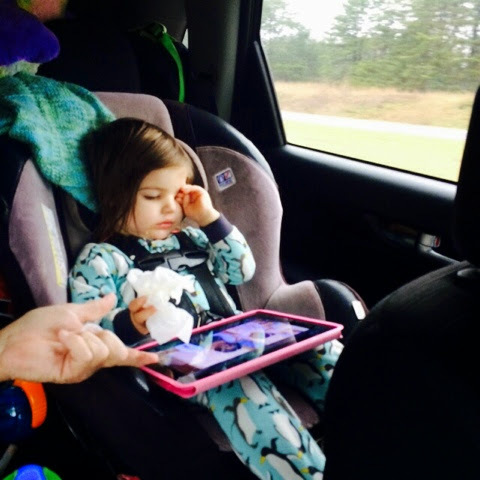 Long car rides with potty-trained toddlers. Lessons learned. We go to Texas at least once a year because my husband is from Lubbock. Before we had a child, we drove the 1100 miles straight through, stopping only in Memphis, Texarkana and Dallas for quick pee-and-a-sandwich-breaks (we never set foot in Arkansas, as a rule). Driving that far with a toddler is crazy, but driving that far with a potty-trained toddler is just absurd. I almost not-really-but-almost wish we had just spent the $2000 on plane tickets instead. To ruin the suspense, I'll tell you that the wee boy traveled great and didn't have a single accident despite having to occasionally wait up to 20 minutes after asking to go potty. We had a portable one with us, and I could have pulled over on the side of the road, I suppose. He is a runner, however, and I couldn't get the intrusive thoughts of what might have happened out of my head, so I opted to risk him peeing in his car seat to wait for a gas station. It didn't take long for the Wee Boy to learn that if he told us he needed to go potty, we would pull off the interstate as quickly as possible, and he would get to run around in a store full of candy. It was like the perfect "Little Boy Who Cried Wolf" because we had to believe him every single time, or we were the ones who would suffer. Anyway, he did amazingly well and didn't pee his pants, but all those extra stops added up quickly. It took us three days of driving to get home from Lubbock this time, when we used to drive for 18-19 hours straight and just get it done. This year Oklahoma seemed every bit as big as Texas, and Joplin, Missouri, as long as California (do you know how much time we spent trying to find Panera Bread??). 1. Put him in a pull-up, even if he hasn't worn them in months. Just. In. Case. 4. Forgo your snacking restrictions. Our family was like a bunch of gross Americans. We even had a cooler. So much for teaching our child not to eat out of boredom. But Oklahoma is soooooooo loooooooong! 5. Remember that "99 Bottles of Beer on the Wall" is probably not a song you want your child singing to his preschool class when you get back from Winter Break. 6. Most parents will suggest you drive at night. This totally backfired on us, as the Wee Boy hates sleep and hates sleeping in his car seat overnight. We tried leaving Lubbock around his bedtime, hoping to drive about 5 hours while he slept. Instead he cried off and on for 3.5 hours before we gave up and got a hotel somewhere just past the border. 7. Take a train instead. Anything but driving. 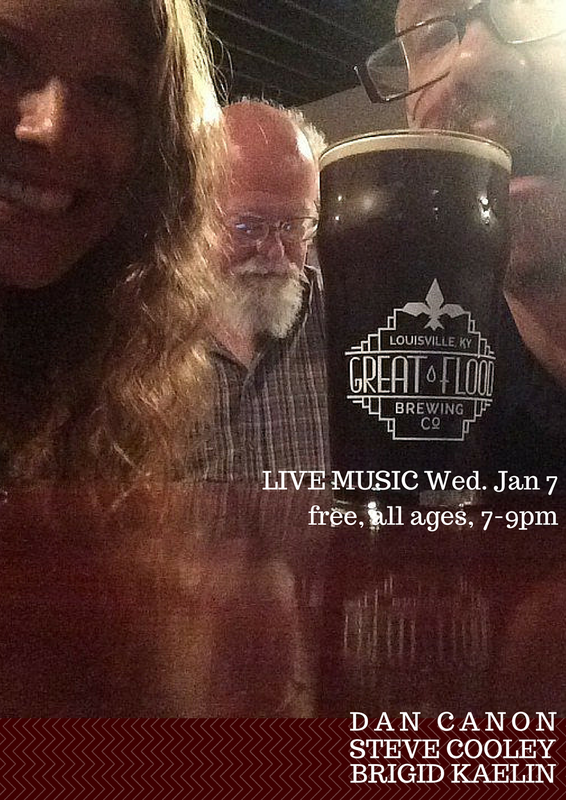 2120 Bardstown Roadplaying all kinds of songs -- bluegrass, celtic, country, rock, originals and covers -- with Dan Canon and Steve Cooley from 7:00pm-9:00pm. We all sing. It's super fun. The brewery is open by 5:00, and we are there by 6ish to hang out first. You can bring your whole family (my wee boy will be there), and you can bring your own food or order delivery. Great Flood doesn't have a kitchen, but is completely supportive of you bringing your own and even offers lots of delivery menus. This show is free. 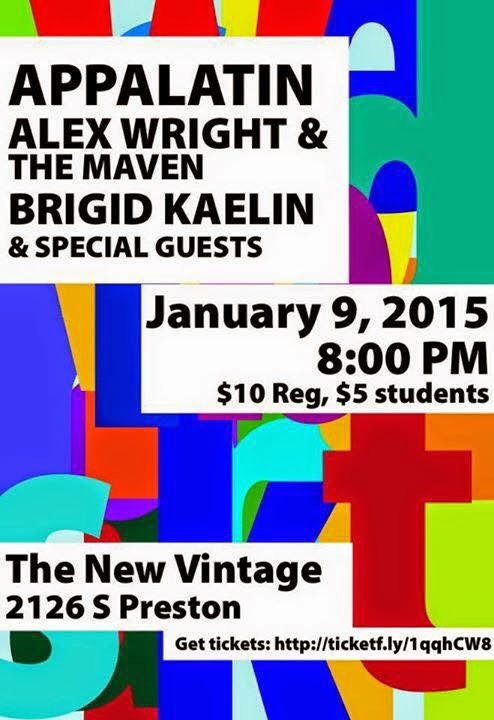 Brigid Kaelin Band show, opening for Appalatin; Alex Wright. Super-fun lineup! 21 and up. $10/person ($5/student). I only played two public full band shows last year. It's looking to be the same for this year. So come out and hear my fabulous band singing songs I wrote. Peter Searcy, Steve Cooley, Dan Canon and Donnie Arbuckle. What I read in 2014. I am on Goodreads. I don't advertise this because I have been in a fiction rut -- to the point where I've been reading mysterious, beach books, and novellas. One could say that I've been slightly embarrassed about my choice of books, but this probably stems from my competetiveness with my dad, who never reads a book with fewer than 900 pages and could be a talking head on the History Channel considering all the history tomes he has read. Even when he reads fewer books per year than I do, he triples my page count. Anyway, last year was not a proud year of reading for me, but I did manage to finish 32 books -- 11131 pages. Here they are, and no judgment, otay? Otay. The Silkworm (Cormoran Strike, #2) by Rowling, J.K.
You know, I said it wasn't a proud year, but there are a few books on this list that were beautiful and moved me to tears. 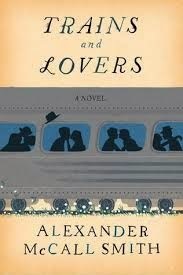 My favorite of all them was probably Trains and Lovers by Alexander McCall Smith. I've said before that he is my favorite (favourite) author. Next time I'm in Edinburgh, I'd like to buy him a cuppa and just talk and see what musings he spouts. I could maybe bring up that his daughter has seen me naked (she was my GP after my son was born, but "your daughter has seen me naked" is perhaps a better hook). I also loved "Paris: A Love Story," but I adore Paris and I used to babysit for the author's family when I lived in New York. So it was easy for me to picture the family members mentioned in the memoir. Clean slate, positivity, after a tearful career moment. Ah, January 1. The day of the clean slate. I had planned on beginning the new year in the recording studio finishing up one song I actually already had drum tracks for. It didn't happen. To be honest, I cried -- a long-winded and tearful monologue about how hard I've been trying to pull myself out of a rut, to make fruitful plans and be proactive, and when I finally had sorted out the magical triumvirate of childcare, a day off from work, and a recording studio, I was defeated yet again. It's nobody's fault; things come up. But it tipped me over the edge, and I grieved hard for my career. I just don't know when all three will be available to me at the same time. Beyond that, I'm not sure what the point even is, except that my sanity kind of depends on it. I'm tempted to do what I did last time, and just leave town for a week, use studio musicians I've never met before, and just get it done. I'm much quicker-than-average in the studio when it comes to recording my own parts. It's the pre-production that's killing me. But, yeah, a week off? Not practical, and I want to be home with my wee boy. He did come over to me and snuggle and make it better. "I'm just feeling sad because I didn't get to sing songs today." "Oh, Mommy, I'm sorry. We'll sing songs. I'll make you happy." (Gives giant hug and loud kiss.) "There, are you happy now? Are you feeling better now?" He's singing Frank Sinatra songs. He's a dreamboat. I write now because it's cathartic, but I also know it's more useful to be positive. So ... moving on ... I shall now think about the things I did accomplish today. Not spend any money (except for the mortgage). Play trains with the Wee Boy. Play cars with the Wee Boy. Read stories with the Wee Boy. Spend every minute of the day with my husband. Not have a drink. Although, you know, I think right now I am going to pour myself a scotch whisky, so now I shall use the fancy crossing-out-font on number 10. I had a really great New Year's Eve. 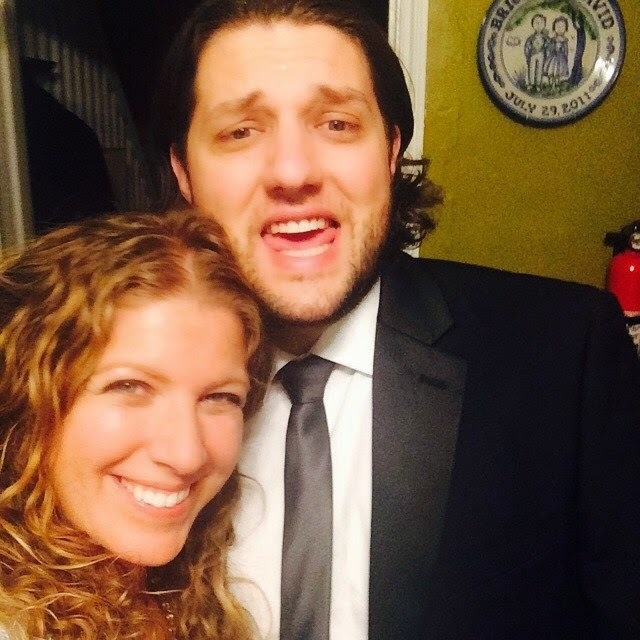 David wore a tuxedo, and I wore makeup. Positivity is not a new concept, but it's certainly hard to remember to focus on it when you really need it. Maybe it's time for a little Perry Como. Tis the season, anyway.